Years ago, when I saw Ramachandran for the first time, I was awestruck by his size, his elegance and witnessed the magnificence that he has in most pageantries. Over the years, I started understanding elephants better and my perception about the species and its state changed enormously during my transition from a primary school elephant lover to a biologist. As someone who has seen in and out of the elephant business (is there a better term for it? ), from various positions – as an enthusiast, as a learner, as an activist, as a biologist and at some point even as a mahout, I realise the complexities involved in the trade and how easy it is to make judgments and how uneasy it is to make implementations. 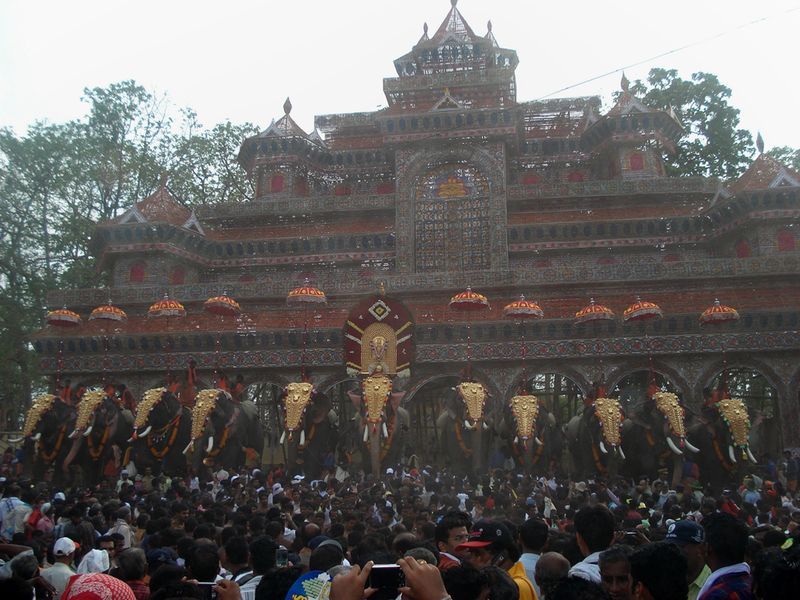 On the eighth of May this year, I was asked to go for the pooram festival at Thrissur with some friends who wanted to film the extravagant event, possibly the largest in the world. Sources had informed us about the exact number of elephants that are going to be present with the list of ‘celebrities’ who are invited to add pomp to the show. After hours of negotiations with myself, I finally decided to be there, one of the major reasons being Ramachandran’s ‘guest appearance’. 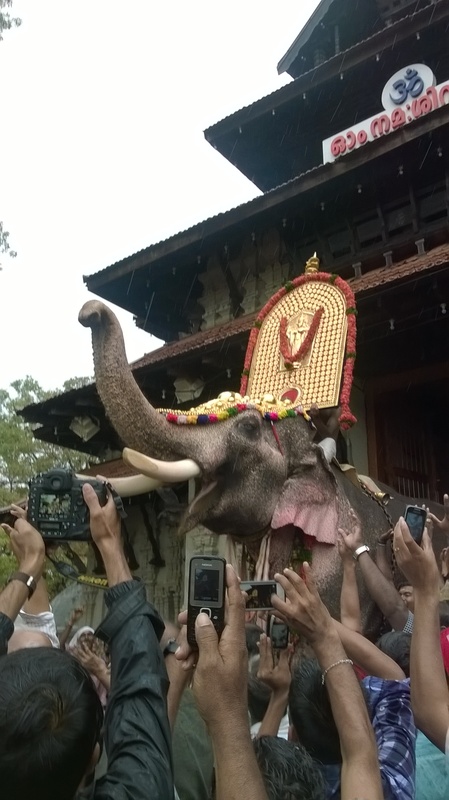 After few hours of traveling from my field site in Valparai, we reached Thrissur around noon on the 8th to witness hundreds of people waiting in front of the main temple, unfazed by lashing rains, just to get a glimpse of Ramachandran stepping out carrying the idol. And in a few minutes there he was, amidst jeering and shibboleths, he walked out of the temple gopuram, in his everlasting majesty. Kalyan and Mandanna (my friends who were filming the event) managed to wade through the crowd, to get up, close and personal. As I hark back to Ramachandran’s stories, one of the most celebrated and highlighted ones in his life, was his arrest after he trampled three women to death during a procession near Ernakulam on 27th January 2013, perhaps the first incident of arrest of a non-human animal. He was ‘behind bars’ for few months till his owners decided to go for legal proceedings and took him out on bail in early March 2013. Although sounds so dramatic, the life of this individual elephant itself is like that, with a crime record of killing eight people, two elephants and injuring yet another elephant. Standing 3.17m tall, perhaps the tallest Asian elephant living in captivity, Ramachandran is blind on one side making him more apprehensive about sudden moves, presence of elephants on that side etc. However, the mahouts who are responsible for the blindness would have thought that handling him would be easier from the blind side. Mani, who has been Rama’s mahout for the past 17 years, reiterates the same, that he’s more cautious on the blind side. Mani has learnt several lessons through this decade and half long relationship and has warned his successors, who took charge last year about possibilities of further mishaps. Shibu and Rajesh who are the current mahouts feel that Ramachandran, who is completing his 30 years in Kerala this year hasn’t lost any of his spirits over the years and despite being in his fifties still has a bad temperament towards conspecifics. He came to Kerala from Bihar, like many of his peers, in the early 80s when the influx of elephants from Bihar, Arunachal and Assam was at its heights. A regular mediocre elephant back then, recalls some of the senior mahouts about a young Ramachandran. 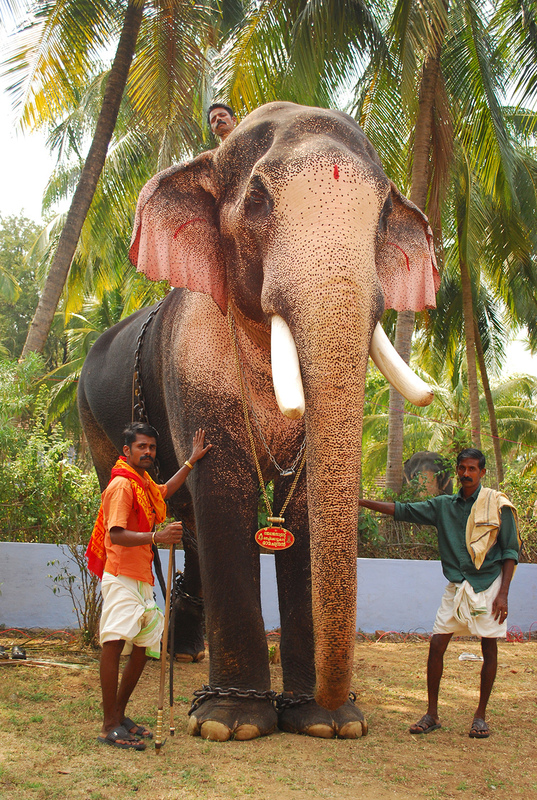 He started growing suddenly in the 1990s, growing to be the second tallest elephant after Kandambulli Balanarayanan, who stood 320cm at his shoulders. Ramachandran had by then slowly started becoming mischievous, giving trouble to most mahouts who worked with him and eminent mahouts like Kaduva Velayudhan had also tried his luck to bring this alleged ruffian under control. In course of these mahout transfers, Ramachandran lost his right eye, thanks to the idea and implementation of one of the mahouts. The general ‘theory’ of controlling a rogue from the blind side failed in the case of Ramachandran as he went on to continue his tough behaviour. By the time he was accused of killing two elephants including a celebrity, Ramachandran was already blacklisted and by end 1990s he was feared by most. 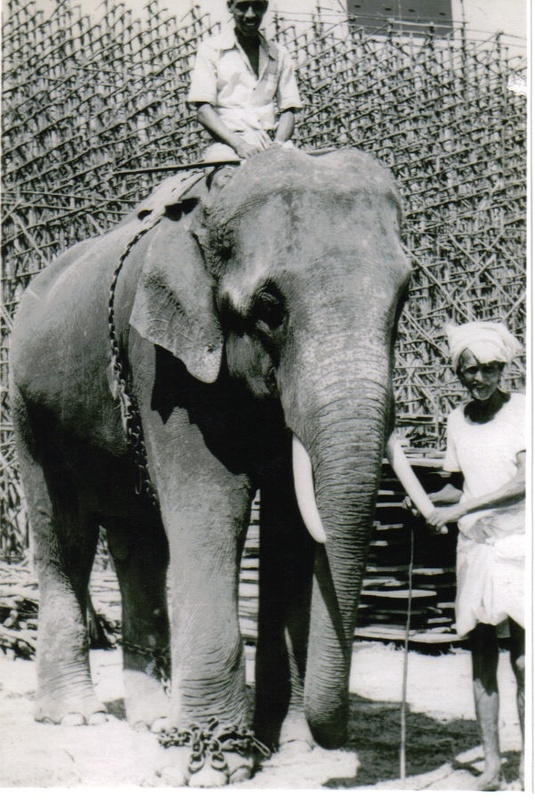 He had already caught a lot of media attention as well, by even running up a terrace building in pursuit of a mahout. 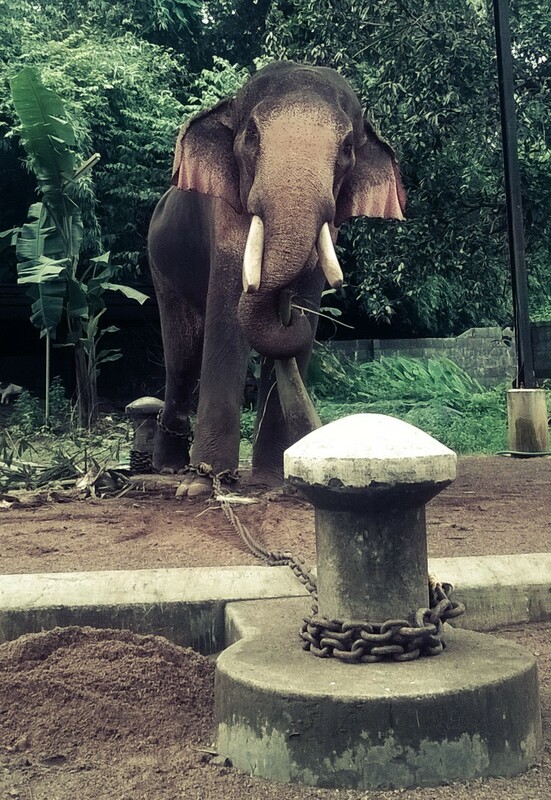 It was presumed that his dark days began, when he gored Thiruvambadi Chandrasekharan, a celebrity tusker and the lead elephant of the Thrissur Pooram. However mid-2000s saw an increase in the so-called elephant lovers who celebrated the lives of elephants through social networking sites, which were just neonates. Ramachandran resurrected from dark depressing months at tethering yards to become the matinee idol of the new-gen elephant lovers in the state. With increasing publicities, came increasing demands and problems. Ramachandran was being sought by most festival coordination committees as they believed his presence could attract more people and money. With couple of years of abstinence from his regular behaviour, Ramachandran marked his presence loudly, running amok at a temple causing damage worth thousands of rupees. Timely intervention of the Elephant Squad prevented fatalities from happening. However January 2013 witnessed the worse of all when the incident happened and the ‘proactive’ officials finally decided to keep him off the festivals by ‘arresting’ him. A short imprisonment, including a break from festivals for over a year and Ramachandran was back in 2014, with new care-takers, still maintaining his heroic status (or perhaps with a more higher one). And the people welcomed him with extreme delight and fanfare. Spending the off-season at the backyard of the Thechikottukavu temple near Thrissur, Shibu and Rajesh are happy of accomplishing a dream, of completing a festival season without any mishaps, Ramachandran perhaps nods (or flaps his ears?) in agreement. Slipping into his annual paroxysms of excitement, the quinquagenarian sways in trance, as the first drops of musth fluid oozes out of his temples. Driving back home from the temple after watching the Matangalila for a while, the state of confusion still haunted me; the paradoxical argument that although Ramachandran and his peers manage to get away with the amount of damage that they cause besides human and elephant fatalities and injuries, their wild counterparts are still paying a huge toll for relatively less damages.